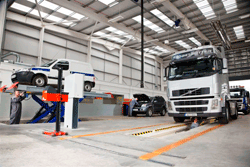 Irish Commercials (Sales) Ltd is a Volvo Truck and Bus Dealership and has a state of the art workshop where all maintenance and repairs on the Volvo range can be carried out in conjunction with the annual DOE Test. 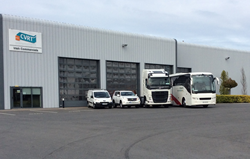 Irish Commercials Vehicle Testing Centre is an approved HGV and LGV vehicle test centre and also provides Tachograph and Road Speed Limiter Calibrations and Vehicle Plating. We are part of the VTN network and provide the full range of tests from our new state of the art premises at Millennium Park, Naas, Co. Kildare, which is just of the M7 between Naas North and Naas South exits. Our online booking system makes it easy to book a test. To make a booking, just click the 'Make a booking' link above. Full information on how to locate us and about the test requirements and prices are provided on the tab links above. Further more, Irish Commercials (Sales) Ltd is a Volvo Truck and Bus Dealership and has a state of the art workshop where all maintenance and repairs on the Volvo range can be carried out in conjunction with the annual Commercial Vehicle Roadworthiness Test (CVRT) . We offer highly skilled Volvo trained technicians, Volvo special tools to increase efficiency and safety while working on your vehicle's, 93% first pick availability on spare parts and the balance available the following morning at no extra cost! We carry out work from one of the most modern and well equipped workshops in the country and can offer an emergency repair service from our drive-through express bay which requires no advance booking or trailer to be uncoupled which reduces downtime for our customers. In addition to this we have a highly skilled, experienced and customer focused team who always go the extra mile to ensure that all your transport needs are taken care of. To give unbeatable peace of mind, we also offer 2 years warranty on most parts fitted in our workshop and 3 years on engines, gearboxes and differentials that are fitted. We run regular aftermarket promotions and currently have very competitive ones for Service Menu Pricing for Trucks and for Buses & Coaches. Please see our website www.irishcomms.ie for information about our other promotions and what we can offer your business.